What: Proof on Main, in the 21c Hotel in Louisville, is one of the best places we know to drink bourbon. So it’s only fitting that they’ve got you covered the morning after, too. 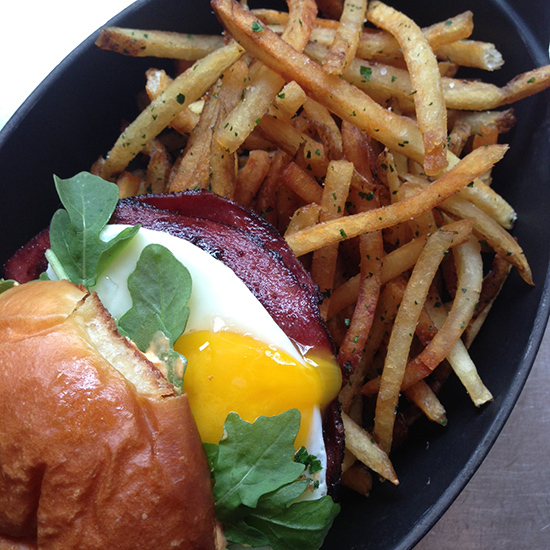 Chef Levon Wallace’s fried bologna sandwich fits the bill exactly. No, not the wobbly slices of baloney you remember from childhood, but incredible house-made stuff made from bison and heritage hogs, smoked over pecan wood. It’s cut into thick slices, then fried up. Add a fried egg and pimento cheese, top with arugula on a toasted, buttered bun, and you’ve got a breakfast sandwich for the ages. Wash it down with: The bitter, hydrating Late for Work—the amaro Cynar with grapefruit, lemon and ginger ale—will bring you right back to life. Is There a Better Sandwich Than an Uni Sandwich?